Nine months ago I wrote about my experience with FON over the past four years. I was not very positive, but thanks to our fellow sysop Steven Leeman, it got the attention of FON. To my surprise they offered me a free sample of their latest wireless router, the Fonera SIMPL. Not for writing such positive articles about FON, but for being such a loyal and persistent contributor. My FON spot has been on-line for almost five years now and they appriciate that. So having the Fonera SIMPL for free, it is only fair that I write down what I think of it. The Fonera SIMPL arrived about a month ago and so I took down the Linksys that had been quitly humming in the attic for almost five years and replaced it with the Fonera SIMPL. The Linksys has been reflashed with a version of OpenWrt that supports IPv6 and it is now hanging in the meter closet, functioning as my main router. Both have been humming away quietly for almost a month now without any need for a reset. The name is appropriate. It is basically a somewhat stripped down version of the Fonera plus. It has a WAN and a LAN port. The radio section supports 802.11n. What is stripped down is the firmware. Only the basic functions are present. The antenna is removable. So connecting an external antenna - a 7dBi omni in my case - is no problem. Power consumption is low. A simple small switched adapter suffices to power it and it stays cool. A vast improvement over some of its power hungry predecessors that suffered from overheating problems. Summer is yet to come, but I expect no overheating problems with the SIMPL. It is stable. Contrary to some of its predecessors this Fonera is stable. I installed it a month ago and more or less forgot it. Every once in a while I check if it is still on air, but as it always is, the intervals get larger and my confidence that no resets are needed increase. There is no obvious way to screw it to a wall. It has rubber feet, so it makes no scratches on your desk, but I prefer routers and switches not to clog my desk, I want to screw them to a wall. So I made a very simple holder that I folded from sheet aluminium. A suggestion for FON might be to have such a holder made out of plastic. When mass produced, it should not have to cost more than a few cents, so adding it as a free extra would not make FON go broke. No bridge mode for the private signal. I wonder why FON is so hard headed about this. Users have been asking for this feature from the very first Fonera, but FON turns a deaf ear on them. The beauty of the Fonera SIMPL is in its simplicity. The flip side of that simplicity is that for many, it is not powerful enough to serve as their main router. So they put it behind a NAT and use it as a wireless access point only. No big problem for the public signal, but the private signal is next to useless in this mode. The machines on the private signal are isolated by a firewall from the machines on the main LAN and that is not what most users need. It does not bother me much, as I do not use the private signal anyway. When I need WiFi for myself, I use the signal from the old Linksys. It gives me full access to my LAN and it does so using IPv6 too! The SSID of the public signal can not be changed. 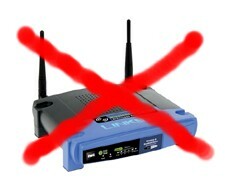 It is set to FON_FREE_INTERNET and that is it. I do not like it. First: it is misleading. It is NOT free. Yes, the services of some of FON's sponsors as Gmail and some others are free and you can get a 10 minute trial period by clicking on some advertisement, but to obtain full internet access, you either need to pay or be a Fonero that has his own FON spot up and running at home. Calling that "free internet" is misleading. Plus of course that I simply want to advertise my FON spot as something more than jus a FON spot. I want the SSID to reflect the fact that is is my FON spot. A restaurant owner or any other bussines using a FON spot to attract customers, would want that even more. No personalisation of the landing page. The older Foneras offered the options of doing some (minor IMHO) personalisation to the landing page. With the SIMPL this is totally absent. Pity. My provider blocks port 25 outgoing, except to access their own SMTP server. With previous setups I added a small text to the landing page telling my users what SMTP server to use if they wished to send e-mail via SMTP. With the Fonera SIMPL this is no longer possible. Standard landing page only. The internal web interface is only accessible via the LAN port. Good for security, but a bit akward for those who have made no compromise on range, do not use the LAN port and who placed their Fonera in a less accessible place as an attic or a radio tower. Having the option of accessing the web interface via the WAN port would be nice. OTOH, there is not much to configure that needs frequent changing, so it is not a big deal. No SSH or Telnet access. Not a big deal either. The Fonera SIMPL serves its purpose well for those who expect no more than the name suggests. 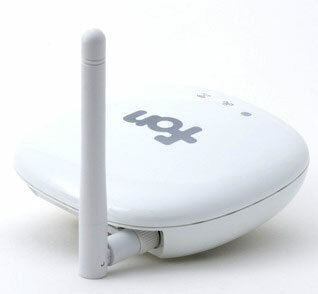 For use as just a FON hot spot, it is almost all that one could want. It is stable, it is undemanding on energy, it is not saddled with unneeded whistles and bells. I have to admit, I like it more than I expected. 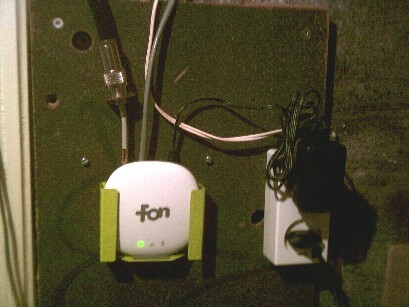 It has a its shortcomings, but for what I use it for: just a FON access point, it is better suited than all the other Foneras that I had the pleasure to test. This article was first published in FidoNews , April 4th 2011. Laatst bijgewerkt | last changed April 19, 2011.